Proper contact lens care can be a daunting task for many. Making sure that you, or your children, are using the right contact lens solution, in the right amount and changing it every day, as well as sticking to your doctor recommended replacement schedule every 2 weeks to a month, is a burden that most are not ready to handle. As a matter of fact, recent studies reveal that as few as 2% of all contact lens wearers actually clean and store their contact lenses as they are supposed to. As a result, the majority of people wearing rigid gas permeable or bi-weekly and monthly disposable contacts, expose their eyes daily to a host of harmful bacteria that can grow on their lenses over time and cause serious eye infections that have the potential to do severe damage to their eyes, up to and including total blindness. Fortunately, a significantly safer contact lens alternative does exist daily disposable contact lenses. Simply throw today's pair away before bed, and enjoy the benefits and comfort of a brand new, clean, crisp pair of contact lenses the very next morning. Contact lens-related infections and eye conditions that result from improper cleaning and storage are a thing of the past. Now, you can enjoy the simple pleasures of crisp, clean, comfortable vision at the start of every day. Another important advantage of daily disposable contact lenses is that there is no longer a need for you to worry about being forgetful when it comes to your contact lens replacement schedule. Many people are not aware of the extent of damage that can be done when contact lenses are not changed for a clean, new pair on time. 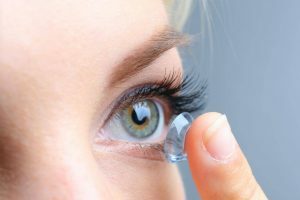 Wearing contact lenses until they become uncomfortable to wear, and then switching them out, is an all-too-common and very damaging practice. Most people are unaware that by the time their contact lenses feel uncomfortable on the eye, serious damage may have already been done. With daily disposables, if you can remember that every morning starts with a new pair, then you're set. Daily contact lenses are a great way to start enjoying stress-free, crystal clear vision every day. For more information, and to find out if daily disposable contact lenses are right for you, contact your eye doctor today!